Schluter displays one of his creations. He's crocheted dozens since he began the craft as therapy. Crocheting wasn't Bill Schluter's go-to until he went to see his doctor. Five years ago, Schluter picked up a crochet hook and yarn when the doctors at Mayo Clinic in Rochester, Minn., suggested that the handicraft could help him with recovering from his short-term memory loss after a brain injury. However, his new hobby started to carry more meaning after a tragic accident in 2014 when Schluter's grandson died in a drunk-driving accident three days before his 18th birthday. "The last thing he had asked me to do was make a blanket for a teacher who was kind of special to him," Schluter told ABC 6 News. After Bill finished making the blanket to keep his promise to his grandson, Schluter made 35 more for the kids in his community. 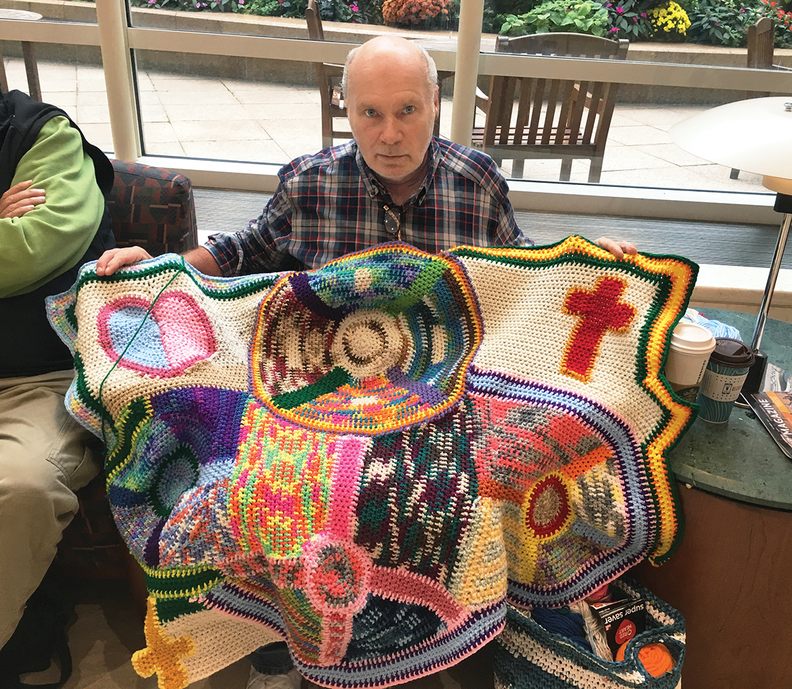 He continued to crochet through his diagnosis of stage 4 colon and rectal cancer in March 2017 and the ensuing chemotherapy. He recently made more blankets for 30 children at the Ronald McDonald House in Rochester. "I hope they get out of the blankets the knowledge that someone who doesn't know them cares," Schluter told Mayo Clinic. Schluter has completed his last round of chemo but hopes to keep crocheting for those in need.